2019 seems the year of Indian American girls. Since the onset of 2019, we have added stories of several Indian American girls and their achievements to our continued series of Young Indians at Travel Beats, a community portal for Indians in the US by Indian Eagle Travel. This article about four Indian American teen girls among the 2019 Regeneron Science Talent Search finalists is a story of their commitments to keep the earth green and safe through low-cost, accessible solutions to environmental issues including various types of pollution. 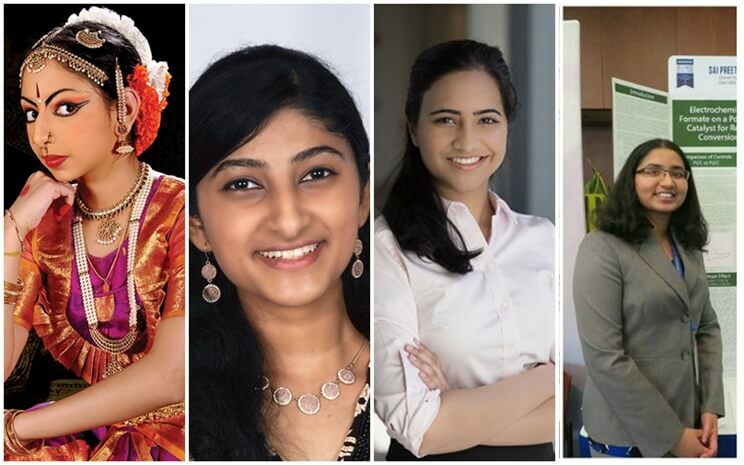 Though these four desi girls could not make it among the 2019 Regeneron Science Talent Search winners, they are awarded $25,000 each for their unique, innovative approaches towards mitigating the direst threats to the existence of life on earth. One of the Regeneron Science Talent Search finalists in 2019, Anjali Chadha from Louisville, Kentucky is awarded $25,000 for her groundbreaking device that helps detect arsenic in well waters. Consumption of arsenic-rich water is leading cause of cancer in the developing countries including India, where millions of people depend on well water sources. A significant population of rural India has no other option than using arsenic-contaminated water because of acute water crisis. 16-year-old Anjali Chadha’s low-cost, portable device can help over one billion people accurately detect arsenic and measure its quantity in the water sources they have access to. Anjali’s discovery of arsenic in the groundwater within 90 miles of her neighborhood compelled her to develop the sensor. During her research on harmful effects of arsenic in water, she came to know that about 50 million Americans are at risks of arsenic contamination as they primarily depend on well water sources. Indian American Anjali Chadha is a bioengineering career enthusiast. Featured in the award-winning documentary ‘Science Fair’, Anjali Chadha is a budding Bharatanatyam exponent. Her nonprofit ‘Empowered’ trains underserved high school girls in technological skills. Among the 2019 Regeneron Science Talent Search finalists, Preeti Sai Krishnamani received $25,000 for her unflinching commitment to remove arsenic contamination in rice. A resident of Hockessin in Delaware, 17-year-old Preeti found that if soil minerals are enhanced, it can help bind arsenic components to the soil and thereby preventing contamination of rice plants. She has created a solution – silicon amendments – with rice husk and rice husk ash, which are usually dumped as wastes from rice cultivation. These can be recycled to enhance soil minerals of paddy fields against arsenic contamination. While researching on potential solutions to reduce arsenic toxicity in rice plants, Preeti found that rice husk ash, a burnt byproduct of rice production, helps bind up arsenic and prevent it from spreading to rice plants through water by increasing iron-oxide minerals in the soil. Her solution, once perfected, will bring in a revolution in Asian countries where a significant number of people are exposed to health risks of arsenic-contaminated rice consumption. Indian American Preeti Sai Krishnamani aspires to be a social entrepreneur in agricultural technology. $25,000 is awarded to Navami Jain of Charlotte, one of the Regeneron Science Talent Search finalists 2019, for her relentless effort to produce bioethanol from agricultural waste products. Bioethanol, a biodegradable and nontoxic type of biofuel, is an environment-friendly alternative to conventional fossil fuels. Why ethanol production is currently not encouraged is because food crops like corn are mainly used to produce ethanol. Indian American Navami Jain’s research shows that it is inexpensive to produce bioethanol from wheat straw. A student at the North Carolina School of Science and Mathematics, Navami Jain aspires to major in biochemistry or chemical engineering. She co-edits her school’s STEM journal titled Broad Street Scientific. She is also cofounder of an ecommerce portal selling organic food waste for feeding cattle. 17-year-old Sai Preethi Mamidala of Pennsylvania is honored with the same award for her extensive studies on optimal catalysts to make renewable energy sources more accessible. The rising level of fossil-fuel pollution in India compelled her to experiment with ways to bridge the gap between the amount of reviewable energy required to reduce people’s use of non-renewable energy and the amount of renewable energies currently being produced in the developing countries like India. A senior at Garnet Valley High School, Indian American Sai Preethi Mamidala is hell-bent on creating efficient storage regeneration processes to promote the use of renewable energy, as part of her commitment to save the planet from fossil-fuel pollution. An avid STEM advocate, Sai Preethi aspires to make it big in energy engineering. Travel Beats, a subsidiary of Indian Eagle, publishes latest visa, immigration, passport, aviation and Indian diaspora news stories. A leading travel booking partner of Indians in USA, Indian Eagle not only guarantees lowest airfares for flights to India but also strives to promote achievements of Indian community in North America.